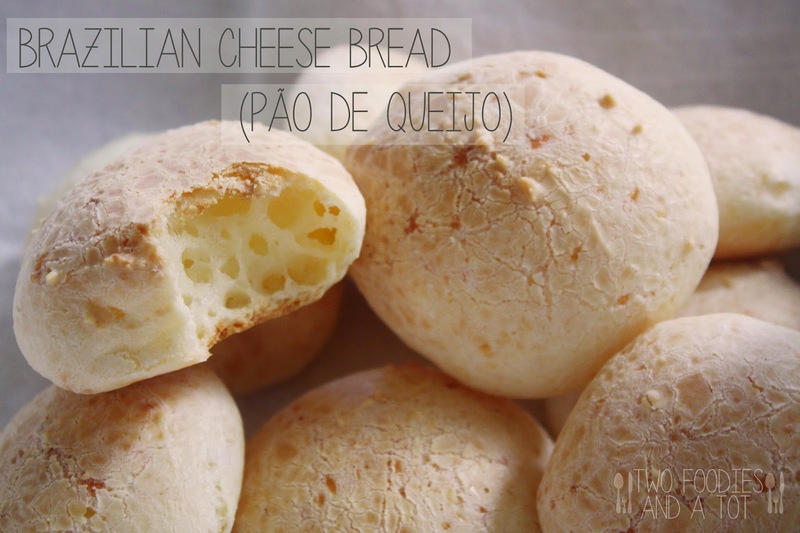 When I visited São Paulo for work years ago, I fell in love with this cheese bread at a corner cafe. Until that discovery, I've never even heard of this. My co-worker's mother recommended me trying this and I was like, why hasn't anyone told me about this chewy, cheesy goodness? It's savory yet goes perfectly with a nice cup of coffee. 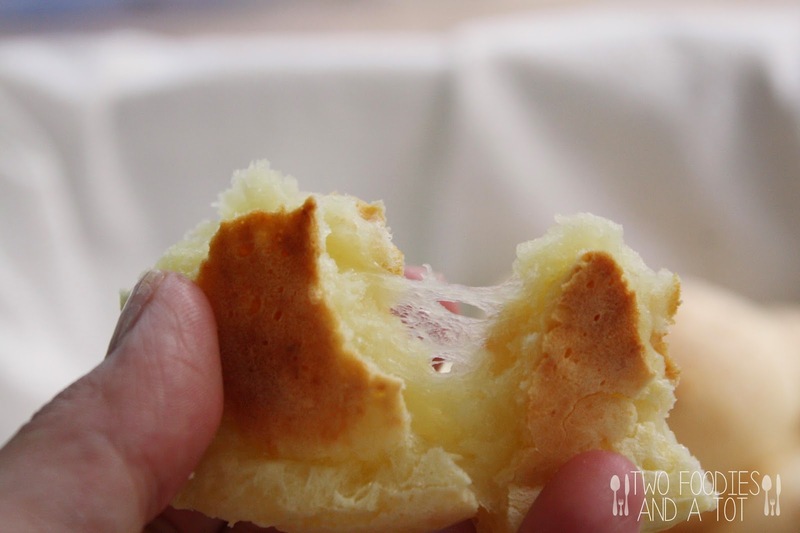 It immediately became my go to breakfast in Brazil after that day. I've tried many different recipes to recreate this bread, they were OK but not a good match to my memory. I was about to give up when my Brazilian friend told me even she buys it frozen as she couldn't recreate it. Then I found this recipe. With just a few ingredients, I could bring back the memory. You can just tell how chewy it is from the picture. I love it! As much as I love it though, I'm warning you. If you haven't tried this and you don't usually like chewy stuff, you might not like this. And I don't know what the secret is to keep those little balls so yummy for long at those cafes but in my case, they were the best right out of the oven. So I definitely recommend making small batches as I did. 1. Preheat the oven to 450F. Combine milk, oil and salt in a saucepan and bring it to a gentle boil. Remove from the heat. 2. Add tapioca flour to the pan and stir well. Dough will be grainy and gelatinous at this point. 3. 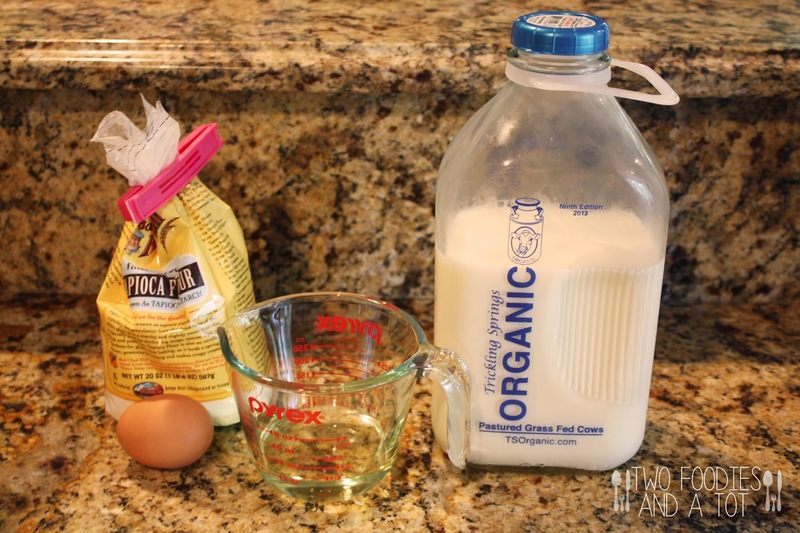 Transfer the dough to a bowl to a stand mixer with a paddle attachment. At medium speed, beat the dough for a few minutes until it becomes smooth and cools off a little. 4. Scrape the bottom of the bowl, mix the egg in until well incorporated. 5. Mix in the cheese. Batter will be sticky and stretchy. Scoop the batter with a medium cookie scoop, place them on a parchment lined baking sheet, it made 12 balls with my scoop. 6. Turn down the heat to 350F and bake the balls for 25-30 minutes.